Summer squash season is among us! In other words, summer is approaching and soon farmers markets will have way too many zucchinis. You know what that means? They'll be in season (aka delicious) and inexpensive. Win-win! And when you see summer squash taking over the farmers market this is the recipe you'll want to make. 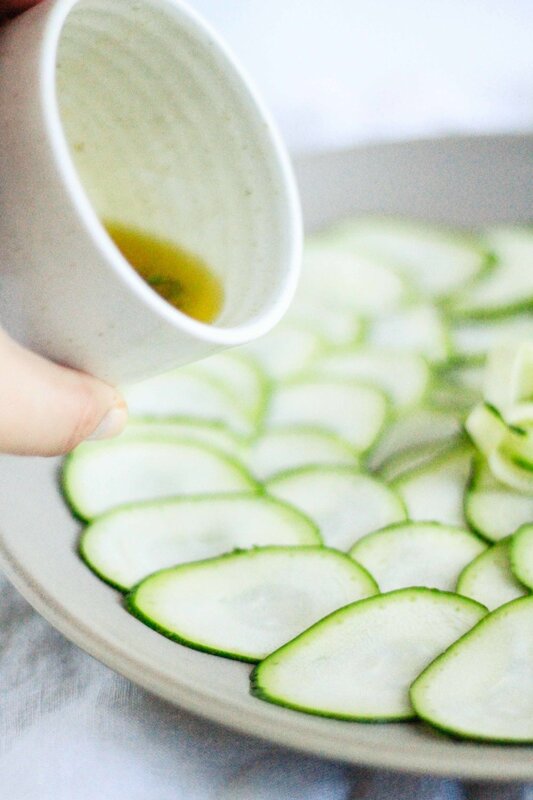 You don't need to always cook zucchini, instead use it it to make vegetable carpaccio. Wait, what's carpaccio? Carpaccio is typically a dish of very thinly sliced meat, but instead this recipe uses raw zucchini. Zucchini is delicious raw when it's thinly sliced. A simple vinaigrette, toasty pine nuts and my favorite go-to ingredient, goat cheese, finishes the dish. Sometimes the best dishes the the simple ones, and this one is up there. Recipe is below! 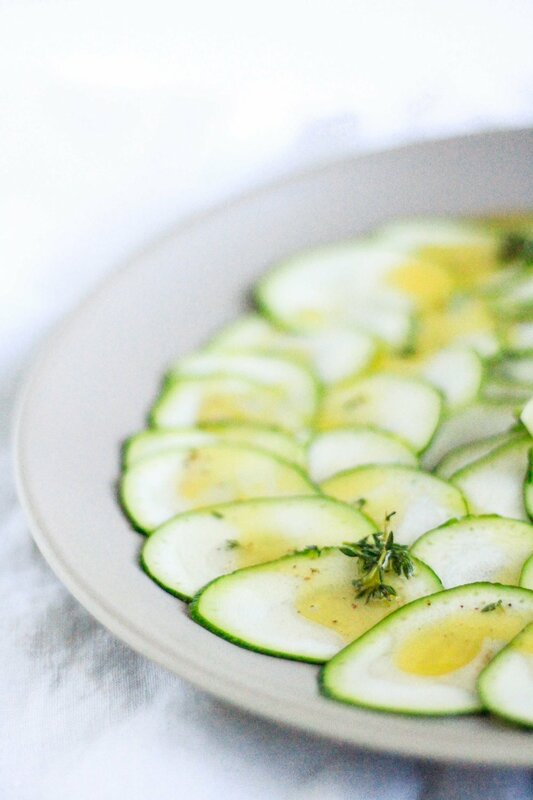 Arrange the zucchini slices on a large dish in concentric circles. In a bowl whisk together the white wine vinegar, olive oil, thyme leaves, lemon juice and a pinch of salt and pepper. 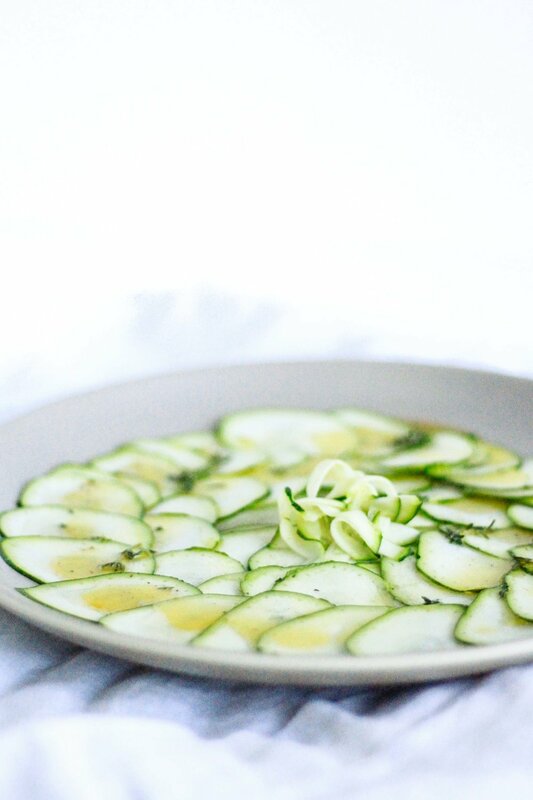 Pour the dressing over the zucchini. Toast the pine nuts in a dry pan (or toaster oven!) until they smell nutty, but aren't browning. Sprinkle the pine nuts over the zucchini, then evenly distribute the goat cheese before serving.